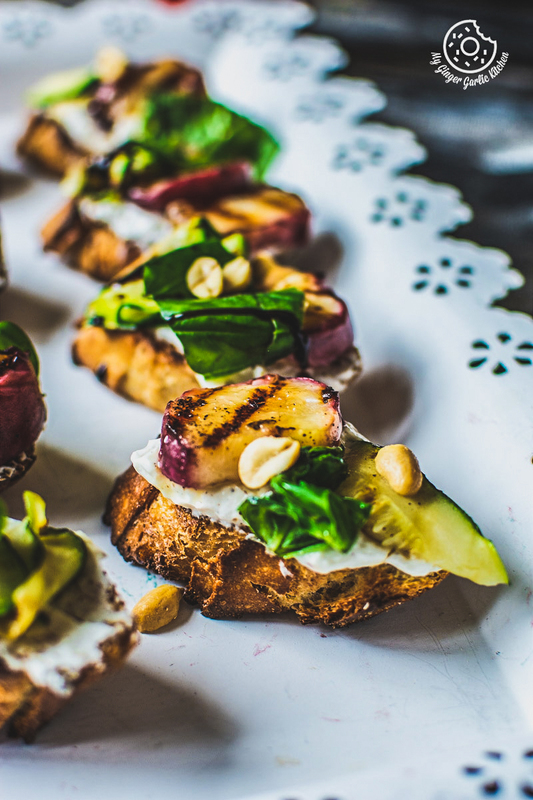 Peach Bruschetta with Whipped Ricotta and Zucchini — A classic crunchy bread, perfect sweet salty and peppery grilled peaches, creamy whipped ricotta cheese, grilled zucchini, roasted peanuts and a drizzle of honey or balsamic glaze and the touch of basil in every single bite. Hello, friends. How are you all doing? Can you believe we’re already touching the end of July? Does that mean this summer is really ending soon? Where did all these warm and hot days go? Yesterday, it was warm enough to wear pretty summer dresses and sandals, and today it is cold again. Sun’s not shining at all — how is this even possible? I had so many plans for this last week of holidays, but it’s gonna be cold for at least the coming 3 days. Forecast tells that from Thursday until Saturday it’s gonna be warm again, so I am just keeping my fingers crossed. It’s not like that this year I didn’t bring these beauties home, but the reason for not making many peach recipes this year is there is one more peach and melon lover in my family. How so? Let me explain. Well, whenever I buy peaches, she makes sure to eat them as a fruit and I join her. I so love that peachy, summery sweetness. SO YUM. And that’s why at the end of our peach eating-spree, I am never left with enough of them for any recipes. But still somehow, away from the prying eyes, I managed to save some this time, and managed to make this awesome Peach Bruschetta with Whipped Ricotta and Zucchini. 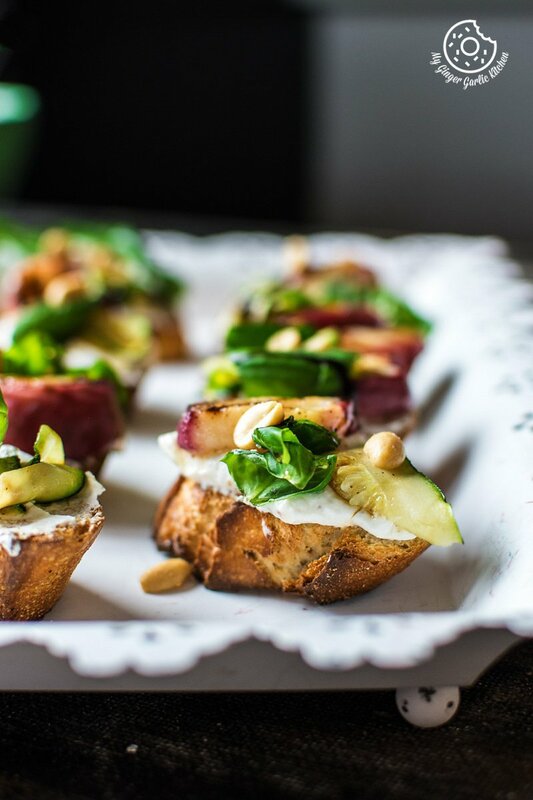 The most thing I love about this appetizer is that it comes together quickly. 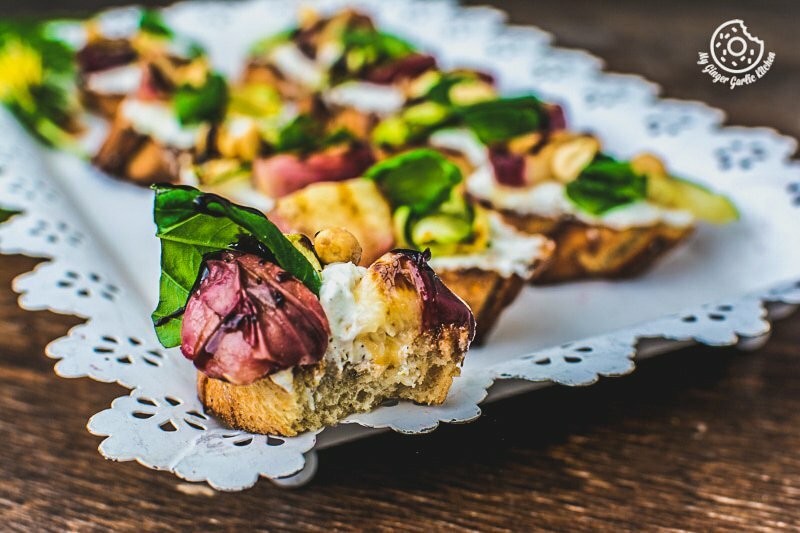 So when you are in hurry and can’t decide what appetizer you should make for summer get togethers, then this bruschetta can rescue you. It has a nice balance of awesome summery flavors and textures. 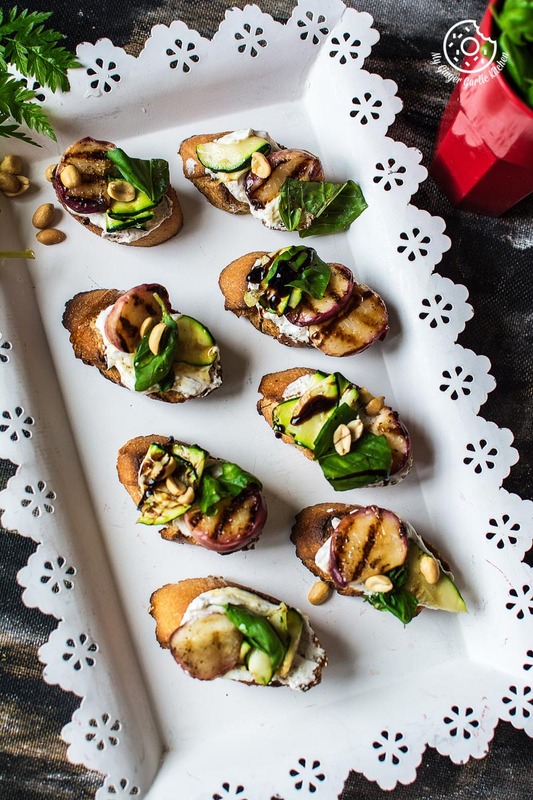 Just imagine, the classic crunchy bread, perfect sweet salty and peppery grilled peaches, creamy whipped ricotta cheese, grilled zucchini, roasted peanuts and a drizzle of honey or balsamic glaze and the touch of basil in every single bite. Mmmmm, for me these overpowering summery flavors are so divine. They are appetizers, but I also like to enjoy them as a light summer meal. So what happens when you combine grilled peaches with ricotta and zucchini? Magic happens. If you love peaches like me, then this is a must try recipe for you. My family is so obsessed with these beauties; they have been bribing me with massages to make them every Friday. And I make sure to take full advantage of this bribing proposal. Well, why not? You don’t get such awesome offers often. 😉 So you can say that this is a staple at my home this summer. 1. Preheat the oven to 300°C and turn the oven to high broil. 2. Slice baguette into 1-inch pieces. Arrange them on a lined baking tray in a single layer. 3. Drizzle both sides with extra-virgin olive oil and sprinkle with salt and pepper. 4. Broil each side for about 1 minute or until browned around edges and tops are nice, crispy and toasted, about 1 minute each. You can also toast them on a grill pan. 5. Heat up a barbecue grill or grill pan or panini press. 6. Arrange the peach slices on a grill pan and drizzle both sided with extra virgin olive oil. 7. Sprinkle with some salt and pepper. 8. Grill the peach slices, cut-side down, over a medium-high heat until grill marked but they should not be too soft and still holding their shape. 9. Flip them and grill it from the other side too. 10. Remove from the grill and set them aside. 11. Arrange zucchini slices drizzle both sided with extra virgin olive oil. 12. Sprinkle with some salt and pepper. 13. Grill the zucchini slices, over a medium-high heat until grill marked. 14. Remove from the grill and set them aside. 15. In a bowl add whipped ricotta, lemon zest, salt, pepper and stir well. 16. Smear the ricotta cheese on the toasted baguette slices. 17. 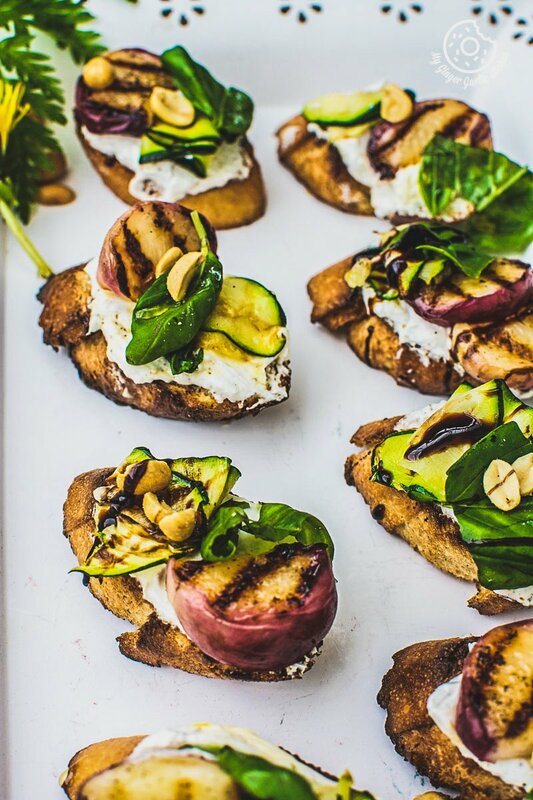 Top the cheese with the grilled peach slices and zucchini slices. 18. 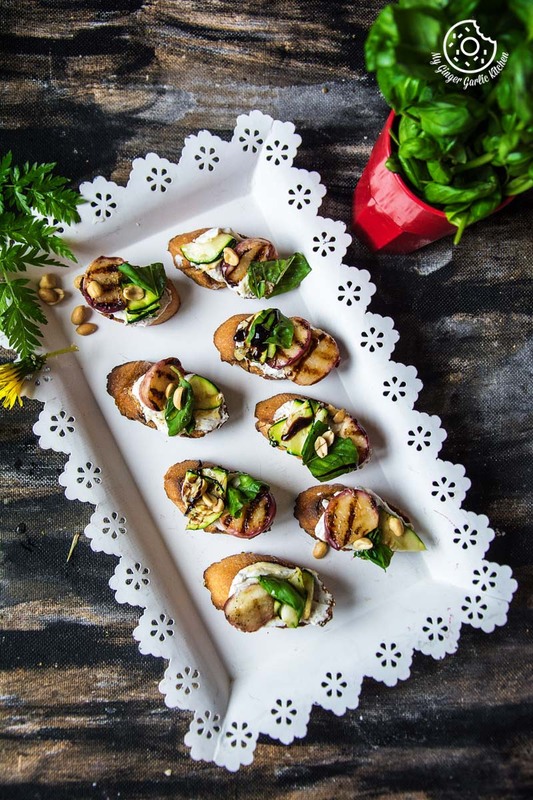 Sprinkle some roasted peanuts and garnish with basil leaves. 19. Drizzle with balsamic vinegar or honey. 20. Repeat until every slice of baguette has been prepared.